For superficial to medium depth scars we use Fractional erbium fibre laser. This laser employs the “only one pass” formula. It is effective, saves your time and protects your skin. ResurFX uses a 1565 nm fiber laser and a very advanced scanner – say good bye to your scars! This treatment is one of the most stable scar removal techniques which have less danger and pain. It is a non-invasive treatment which needs no downtime as the process involves delivering rapid energy with the help of fractional laser technology. – get your treatment and resume for work the same day! The microbeams penetrate deep resulting into regrowth of cells and collagen remodelling. It offers a number of advantages when compared with similar treatments. Faster; it treats the underlying condition in one pass without harming the skin’s surface. Less painful; the device’s energy is dispersed to prevent overheating and damaging skin surfaces. This Fractional erbium fibre laser is the latest in non-ablative, fractional laser technology. Non-ablative means it does not damage or ablate the skin cells, while fractional means it is only affecting a fraction or percentage of the skin. The advantage of this technology is that it is able to give great results with minimal recovery time unlike the CO2 laser, which has few or more days of peeling, crusting and possible swelling after the procedure. 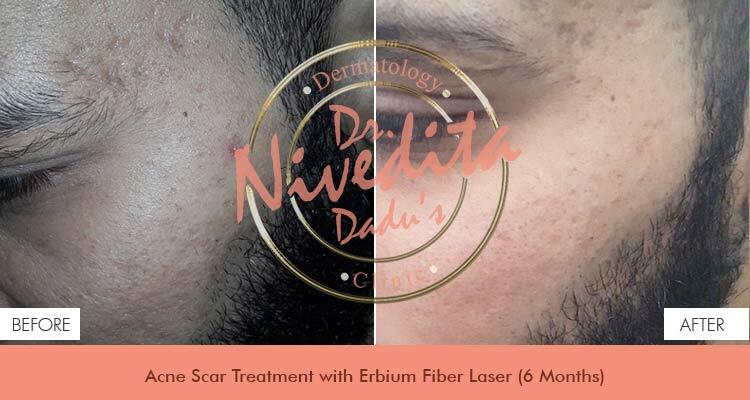 The non-ablative fractional Erbium fibre laser uses a wavelength that does not cause the water in the tissue to evaporate (ablate) but rather the laser energy warms the tissue in a controlled manner. The rise in temperature encourages neocollagenesis, a process in which new collagen is created by the body. Collagen is a fibrous protein which gives the skin its elasticity and suppleness. By producing new collagen the skin regains it youthful appearance. Treatment downtime is significantly lessened as the treatment does not involve tissue evaporation or ablation, which is also why it is preferred over ablative treatments by many patients. The advanced technology offers deeper dermal laser penetration and is delivered by laser pulses in fractional patterns. The laser vaporizes small columns of tissue on the skin's surface, encouraging the body's natural skin cell and collagen regenerative responses. Because of its miniscule size, the laser does not damage surrounding healthy tissue, allowing for rapid healing to only the targeted area. Before starting the procedure, a numbing cream is applied to the face for half an hour. Once the face is anaesthetised, the duration of procedure depends upon the number of scars. 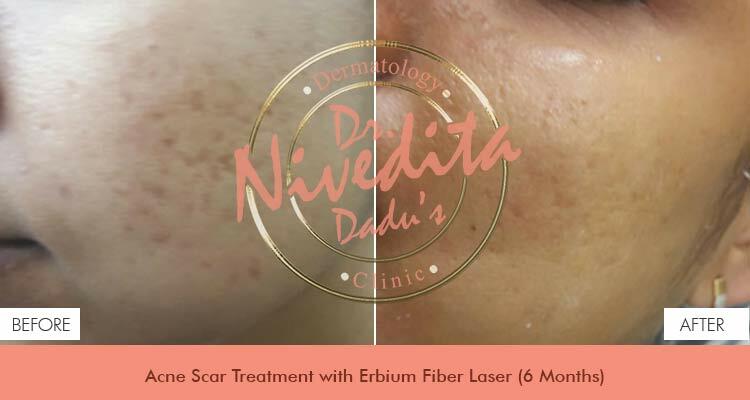 After the erbium fibre laser treatment, patients can return home right away but may feel like their skin is sunburned for initial few hours. The skin may also appear pink or red during this time, which can be covered up with makeup if needed. Over the next couple of days, the skin will then bronze and continue in this pattern as you undergo multiple treatment sessions. Patients may also experience flaking with the appearance of sunburn as the old, damaged skin is exfoliated and new, fresh skin takes its place. Patients may also experience mild swelling and redness, although these side effects usually go away on their own in a small time. The results of the procedure will continue to improve with every session and optimum results are seen in following months. Most patients can achieve effective results from three to five fractional erbium fibre laser treatment sessions spaced almost a month apart. Patients can return to work very quickly after each of these sessions, usually within a day. After treatment it is important for patients to take certain precautions to protect the skin and help it heal properly. Patients should always apply sunscreen of at least 40 SPF daily. This scar reduction therapy helps smoothen and flatten acne scars while increasing the production of healthy cells that gently replaces the scarred cells. We also have lasers that are safe for patients with darker skin types. For acne scar treatment, laser is a non-invasive approach. It is an excellent alternative to surgical methods since it is a quick procedure that can be done even during your lunch time.